I really love them. 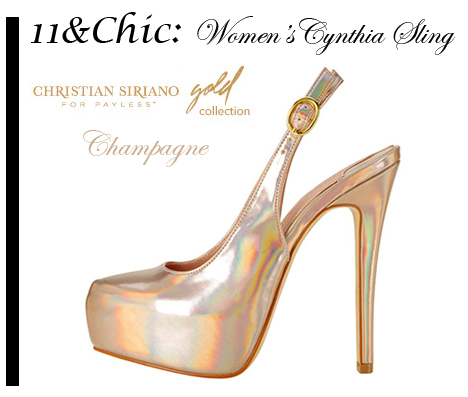 They're by Christian Siriano's Gold Collection for Payless. The "Women's Cynthia Sling" is 5 inches high and has a 1.5" platform. It features a lovely fluorescent material and ankle strap. This shoe are available at Payless so click on the link below to check them out. Tweet @11Chic you're thoughts on this shoe. I can't wait to hear them! Don't forget that there's still time to enter the 11&Chic's $25 Aldo Giftcard Twitter Giveaway! All you have to do is follow 11&Chic on Twitter @11Chic and then tweet "Enter Me". Click here for more details on how to enter!